SAAAGGGGG 4 Sits down to type up a conversation thread. Whoop HEADLINE Robinson Cano sent to the baseball pokey for 3 months ... scan article "Empty locker leaves hole as deep in M's psyche as in its lineup"
JAG 8 Guillermo Heredia now to CF. So, um, does this rollercoaster glide to a stop with a BETTER M's ballclub than it had in the 8th inning?! Of all those sags and jags, you can easily review the above and pick out the choicest. The M's are not only willing to move Gordon back, but to announce it for us. James once admired Earl Weaver's commitment to being SMART and DECISIVE. You like Heredia's chances to hit? You like Dee Gordon's defense at 2B? How then can you not be intoxicated with the M's chances to string a better lineup than the one they had? Guillermo Heredia's OOZ% was 17.1% coming into the game, his SwStrk% 69.0%. His BB:K was a glorious 10:7. And yes, you can judge him by Plate Discipline alone. This isn't a guy who arm-swingin'ly drags the bat through the zone; Heredia EXPLODES so hard with that swing that he normally has to regain his footing after a miss. We're piling on at this point, but his 0.5 WAR -- before the game -- came in fewer than 60 plate appearances (fewer than 10% of a season). "Coming into the game" you say? IN the game he was 2-for-5 with a double, a run, a sacrifice, and something about a gapper that walked the no-Robby squad off. So, yeah, I'm jazzed. 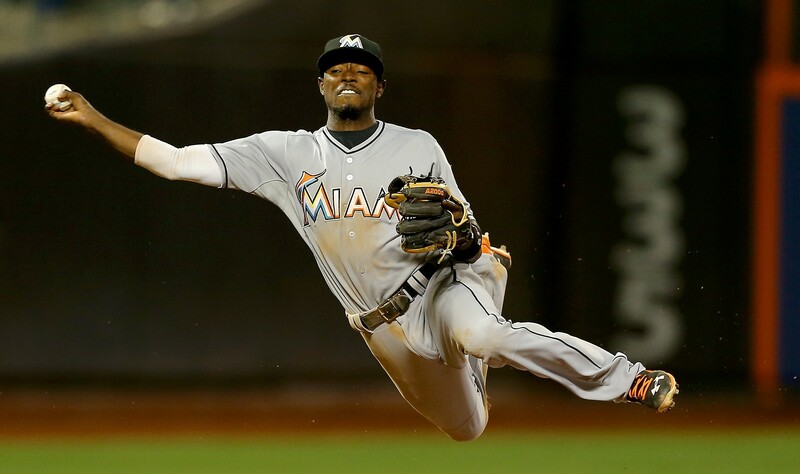 Dee Gordon's UZR last season: +9.8 runs, which is fully 1 win in the standings through glovework alone. Which is +9.8 more* than Robby gave with the mitt, no disrespect to him. His WAR probably square off with Robinson Cano's to cancel the fractions, but many of us are partial to slick, waterbug second basemen. With Heredia's jumps in center and Ryon Healy playing the stuffing out of 1B the M's lineup looks sleek, dangerous, cobra-like. Dr. D is spirally madly out of control, Regis Philbin-style. Mitch Haniger gets to hit #3 now, right? Isn't he the guy who hits like Junior did? So Al Kaline goes to 3 and the end of the lineup will be Gamel 8 and Heredia 9. I'm feeling no pain, babe. I loved the old lineup. Is it wrong to like this new one more? ... I posit this: Robinson Cano was the player we could most afford to lose. Shifting Dee will likely improve infield and outfield defense, and 4th outfielders are one of the teams rare points of depth. Yep. JeDi is looking like Yoda and Mace Windu put together right about now. Maybe he foresaw all of this when he signed Gordon. Well, yeah, but let me wet-blanket it by reminding that you DO need to put Cano back at 2B in mid-August. No team truly wants an upheaval like this one, the possible catastrophe in CF, the second-guessing, the looking like Amateur Hour, etc. But, yeah; it might have been that JeDi liked the idea of having 2B covered for part of a season and factored that in. Luck or foresight, give the M's credit. Sanity and wisdom join forces to prevail in Marinersland. Expert and entertaining take, Doc. Your comment about Gordon vs Cano defensively as secondbasemen got me thinking some more. The UZR evidence is compelling. Still, there's one thing Cano does as well or better than anyone I've ever seen at 2B, and that is turn the DP. With the M's pitching staff, uh, how shall I say this, finding that a large percentage of their pitches get struck with a vigor and squarness that is suboptimal from a pitcher point of view, DP's are CRITICAL to keep the ERA's from inflating to the size of a hot air balloon. So here's hoping Gordon is nearly as good as Cano at this skill. Yep, saw your interesting point on Slack, that we don't get to see those butter-smooth DP's by Robby any more. Will miss those. The overall defensive UZR numbers capture all of that, though, and Gordon's a monster at 2B. Probably due to the same speed he uses in CF. Really looking forward to seeing a super-quick 2B out there; I guess it's this weekend he starts? JD now has half of Cano's salary this year to play with, right? That sounds like exactly the prescription for acquiring a short term rental. Please let that be a pitcher (or two) rather than a left fielder. Plus, there's not much time to figure this out. We've got to put something in the wins bank the next couple weeks. The June schedule is brutal. JeDi in the paper today talking smack about how he's an optimistic person, and how can he turn this situation into a positive. Well, you just named it for him. +1 Diderot. We'll see how serious he is about it. There's a $12M check written to him by Robby Cano - and if the rental joins us halfway through the season, that's plenty for a major star. Let's see it on the field. I'm a homer. But even if I wasn't, it's not often that a player stands up and (appears) to take it and be accountable. $12M is a lot to not fight over. For me, it makes him believable. Whether he's telling the truth about it, or using it as a masking agent, for the time being he gets the benefit of the doubt for me. As any player would who understands and lives by the rules (and/or consequences). As to "steroids", I'm long past the point of being sanctimonious about them. As a 55 year old, I've never been a gym rat. Until about a year ago, when I lost 50 or so pounds and began weight training for the first time in my life. Since I had never trained more than aimless machines and yet this time worked a heavy barbell program, my improvements have been very dramatic. As in stronger than I have ever been - by a lot. To the point of having young guys in our corporate gym asking me what my program is. I don't know how to get steroids or whether I would desire them. But I have learned an awful lot about how recovery works - the importance of stress/recovery/adaptation and its cycle. When we get older, the recovery cycle is generally longer. For example, my body does not let me recover as quickly as the 20-somethings in our gym. So instead of 3 full body workouts per week, I have to do 2-3 or some split style stuff because my body needs an extra day for muscle recovery. When you are talking about professional athletes at their level, the margins are razor thin - and this is their life. I can absolutely see the temptation and see also that each guy may do whatever they can do to stretch to the line without crossing it. For me as a gym rat who's working at staving off early death because I was a tub of lazy goo well on my way, I can live with a slightly longer recovery (and even then I'd be curious about the benefits of steroids). Strength and fitness for me are good things, but they are not my livelihood. Feels good, no? When you throw yourself into a weight / weight loss program like that, you gain so much in terms of self-confidence, energy, mood control, seems like everything in the world... not many 50-somethings can stick with it. Mega kudos. You also ran into something few young people can understand: it's all about the recovery. What can I eat to set up my next lifting session properly? How much sleep can I get? That extra day (or two) is all the difference. Still, it's fun to -- by sheer motivation -- outperform 20-somethings who aren't really very serious about max'ing their workout sessions. Rest is when the magic happens. Biggest lesson ever learned in this area. There is an optimal point of stress without overdoing it. It's not how hard you work, it's how you load, how much rest you get and eating to your goals. You can't out run a bad diet, you can't out-train inadequate rest or grow an unrecovered muscle, and you can't eat enough (or too little) to overcome improper sleep (which is my biggest challenge).